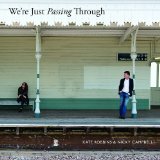 Kate Robbins and Nicky Campbell have teamed up to write We’re Just Passing Through, an album of songs inspired by travel, transient experiences and above all, the ruffled texture of human relationships. And despite a sanguine undercurrent which acknowledges that life has a habit of kicking back, it adds up to a charming and often joyful listen. Campbell’s musical credentials are probably less well-known than his journalism and broadcasting work, and his song-writing skills will be a revelation to anyone who isn’t aware of the swing album he wrote for Mark Moraghan in 2009. Robbins, on the other hand, is a singer and songwriter of wide repute, although she is perhaps most fondly regarded for her gloriously accurate voice work on Spitting Image and Eurotrash. Between them, they’ve forged a creative partnership that on the evidence of this album could run for some time. The musical range is eclectic, swinging – literally – from country-tinged folk (“Tell My heart”, Campbell’s sole vocal contribution, modest and whimsical; the man can sing, too) to bluesy jazz (“The Imposter in my Heart” and “Too Late for Love”) and a bit of guitar-driven rock (Robbins and Ray Brown sing the heck out of the up tempo “Parallel Lives”). But the show-stoppers are some big ballads, which allow Robbins the chance to let fly with a voice that really gives the album its signature sound. Ray Brown, who sings the Gerry Rafferty-esque title track, and Logan Wilson, who gets the slave-to-love swing number “Don’t Start me on Her”, both make significant contributions. Yet it’s Robbins whose voice lingers once the record has stopped spinning. As anyone familiar with her last album, Soho Nights, will confirm, she handles tender-hearted anthems with an instinctive assurance and authority. “And Then I Loved You” and the late-night meandering piano ballad, “Something Wonderful and New” are mature, realistic observations of those touching moments of affirmation in new and seasoned relationships. But the stand-out song is the final track, “I Am Gone”, a grand, literate power ballad about the end of an affair, dripping with stately regret. Readers with long memories might recall that Robbins has Eurovision form, having come third for the UK in the 1980 competition as part of the group, Prima Donna, with the pop song “Love Enough for Two”. “I Am Gone”, in contrast, has a nostalgic feel that recalls some of those classy numbers delivered with conviction, usually by a female artist, in the years before the contest fell prey to spectacle. As a song-writing team, Robbins and Campbell are happily unfettered by any notions of cool, and long may that continue. 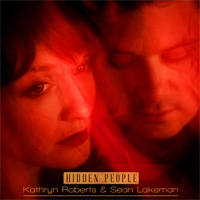 Three songs at the core of Hidden People, the eagerly awaited new album from British folk dynasts Kathryn Roberts and Sean Lakeman, epitomise its sharp brilliance. It isn’t that individually, the surrounding numbers are lesser pieces. It is simply that the gathering sense of an extraordinary listening experience reaches its peak through a trio of story songs that in different ways, showcase the musicianship of Roberts and Lakeman, the lush and plangent arrangements that burnish the album without blurring the clarity of the narrative lyrics, and the range of influences that make it impossible to categorise Hidden People merely as a folk record. Each of these songs – “Hang the Rowan”, with its witch-like promise of revenge woven into a compelling hook of a melody, the aching beauty of “The Ballad of Andy Jacobs”, with Roberts’ glorious voice rendering the disintegration of a soldier’s marriage almost unbearably poignant, and the mystic fatalism of “The White Hind”, bathed in shimmering production values – in some way exemplifies the record’s potent mixture of the poetic and the prosaic, of timeless tales and modern twists, of violence and passion. The clues are all there in the first songs on the album, which take us from a bleak Nordic landscape (“Huldra”), announced a cappella before Swedish sisters Baskery chime in, to America (“Oxford, NY”) before bringing us home for a more traditional three-time folk ballad about an ill-starred love affair sparked at the village fair (“Money or Jewels”). Throughout, soaring vocals and tight harmonies, graced with contributions from the likes of Cara Dillon, Sean’s brother Seth, Dave Burland, and Caroline Herring, add ear-catching nuances so that Hidden People yields new treasure with each repeated listening. Things take a bluegrass turn later, with the story of “Lusty Smith”, and the skiffle beat that announces “Standing at the Window” gives a hint of the influence of the five years that Roberts and Lakeman spent touring the States with Equation before they settled back in Devon to raise their family. So this, in some respects, is a ‘comeback’ album for the husband-and-wife duo – and particularly for Roberts, who has been enjoying the distractions of motherhood, which might make the noir-ish atmosphere of much of the lyrical content somewhat surprising. She admits to a preference for musical edginess to balance the comfort of her home life, but even after plenty of sturm und drang, there is still space here for the contemplative peace of “The Wisdom of Standing Still”. Lakeman has spent the time buffing up his considerable talents as a producer, and the layered sounds of Hidden People – so full of unexpected moments (a bouzouki and a mandolin jostle for attention with guitars, Roberts’ keyboards and woodwind) – amount to a sonic tapestry so skilfully woven that it never threatens to overwhelm. Reviewers need to keep the records moving on, but this one is going to be hard to shift from my MP3 player. As a set of individual, beautifully-crafted songs that amount to a highly satisfying, holistic piece of work, Hidden People is up there with Gretchen Peters’ Hello Cruel World as a contender for my Album of the Year. Tragedy, broken hearts, mortality and violence lie beneath the surface of Lisa Kirchner’s scintillating album, Something to Sing About, like bloodstained rocks. As her vocals spin and gyrate through a cycle of songs that draws on the work of the finest American composers, she covers the range of human experience from girlish hopefulness to world-weary heaviness, exposing these underlying dangers in startling moments of dissonance, shifts in meter and rhythm, and unsettling musical intervals. And all with a lightness of touch that belies the essential darkness of much of the material. These are lullabies with cruel truths at their heart. Kirchner, the daughter of composer Leon and a doyenne of New York’s cabaret scene, has some pedigree. She has personal associations with many of the composers and songwriters represented in this rich collection, who include her father (“Lily” is one of the most poignant tracks), William Schimmel (who plays accordion on many of the numbers), Charles Ives, Wynton Marsalis, David Del Tredici and, of course, Aaron Copeland. As she explains in her excellent notes, Kirchner met Copeland when she was just eight. His music features large, culminating in a beautiful, gentle, jazz-infused take on his arrangement of “Long Time Ago”, which hangs shimmering in the air at the end of the album. The result of this inspiring network of connections is a tapestry of musical genres brought together under the umbrella of the art song, revealing the scope of influences on quintessentially American composers whose work often reflects a European heritage in such innovative ways. It’s impossible, for example, to escape the Brechtian cabaret nuances of Schimmel’s pastiche, “Suicide in C Minor” (the bleak tale of a gangster’s moll); or the chanson flavour of a Ned Rorem melody that provides the setting for Robert Hillyer’s poetic take on the romantic possibilities of Paris, “Early One Morning”. The chanson also informs Kirchner’s own composition, “Crazy Love, Crazy Heart”. Even Lewis Carroll gets a look-in. His ode to Alice Pleasance Liddell finds new life underpinned by Del Tredici’s dreamlike music in “Acrostic Song”. Kirchner herself has written many of the lyrics for the album, most notably for a new version of Paul Chihara’s theme to the Sidney Lumet film, Prince of the City – a gritty paean to betrayal. Something to Sing About is an impressionistic experience, a sequence of constantly shifting musical tableaux that blur the edges and trace intriguing connections between urban 20th century America, smoky jazz bars, Medieval Europe, Shakespearian England (courtesy of two of Stanley Silverman’s Stratford Shakespeare Festival songs), and even burlesque and casinos. It’s an endlessly inventive proposition, delivered with a streak of humour that leavens the ever-present threats and terrors with quirky songs such as Samuel Barber’s “Under the Willow Tree” and William Bolcom’s “Night Make My Day” or a masterpiece of eccentricity, Silverman’s “Photograph Song”. At the album’s heart lies Kirchner’s intense knowledge of her material, combined with an ability to render it accessible. While the listener needs to be on their mettle, they never feel part of an academic exercise. Her musicians include pianists Joel Fan and Xavier Davis, saxophonist Sherman Irby, guitarists Ron Jackson and Vicente Archer, bassist Dwayne Burno and drummer Willie Jones III. Between them, they create a warm, richly textured sound that cradles Kirchner’s voice as it veers from velvety reassurance to acerbic rasp. Rewarding and fascinating stuff. “Christmas has started,” said Anita Skorgan before launching into a chilled, jazz-inflected version of “Silent Night” which achieved the near-impossible feat of giving you the feeling that you were hearing that familiar carol for the first time. It was the last number of a short set intended to showcase the UK release of a special edition of her recent album, Adventus, delivered in the opulent surroundings of the palm court at the Langham Hotel. Skorgan’s surprised delight at the growing British interest in her work was as charming as her songs – contemplative, searching threnodies with a non-evangelistic spiritual accent that is a rare antidote to the annual rash of festive standards already descending on us. It would be patronising to call this Skorgan’s breakthrough when has been a major star in her native Norway for more than 30 years. Yet there’s something very touching and satisfying about a successful, mature artist finding deserved but unexpected acclaim beyond their established market. And for that, she has to thank BBC broadcaster Jeremy Vine, who introduced Skorgan’s showcase and has been playing her songs for a couple of years – and listeners of his Radio 2 lunchtime show, who heard something profoundly appealing in her pure soprano and gentle melodies and wanted to know more about her. That powerful connection was crystallised in the wake of last summer’s atrocities in Oslo and Utøya, when Skorgan sang live on the show, her clear, soaring voice epitomising the dignified grief of her nation. In fact, Anita Skorgan is no stranger to international audiences. But in helping to bring her to wider attention, Vine has succeeded where several high-profile Eurovision appearances failed. Readers whose memories stretch back to the late 1970s might recall her stalwart efforts for Norway, which included the excellent “Oliver” in 1979, a duet with her former husband Jahn Teigen and in 1988, songwriting credits for Karoline Krüger’s fifth-placed “For Vår Jord”. Adventus is actually an updated and largely anglicised version of Julenatt, a 1994 album that sowed the seeds of Skorgan’s hugely popular – and groundbreaking for a pop singer – seasonal tours of traditionally sober Norwegian churches. The first track on the album – the poignant “Is it True” – is the song that captured the hearts of Jeremy Vine’s listeners, and the way she delivered it to an enraptured showcase audience showed exactly why this thoughtful, questioning and deeply personal exploration of hope struck such a chord. Equally absorbing, “The Miracle in Me” was another performance highlight. With lyrics from the pen of Skorgan’s regular song-writing partner Kari Iveland, it interprets the story of Christ’s birth from Mary’s point of view without a hint of evangelising. Like “Peace”, in which faith bursts from uncertainty with a glorious burst of the saxophone from Tore Brunborg, and “Come With Me”, these songs are thematic rather than specifically religious. There are a handful of traditional numbers, including a Norwegian version of “Mary’s Boy Child”, plus Lloyd Webber’s “Pie Jesu”, “Den Fattige Gud” (on which Skorgan is joined by rousing Salvation Army horn orchestra, and the sweet folk song “Et Lite Barn”, all delivered with a vocal clarity thrillingly free of artifice or schmaltz. There’s also a homage to her hero, Johan Sebastian Bach, whose first Prelude she references on “Kyrie Eleison”. Skorgan’s voice has a beguiling honesty and underlying nordic melancholy. Rather than imposing a particular narrative, she invites you to explore a thought or a feeling with her. The result is an album that is evocative and subtly provocative. Light the candles. Christmas has started indeed. Here’s a late blast of summer. A collection of bright, guitar-driven pop songs – self-penned, with a handful of faithful covers thrown in – from London-based Liverpudlian Jo Birchall. A veteran of the first series of Pop Idol, Birchall is blessed with a fine, confident voice and a well-stocked songwriter’s tool chest. Signed to Gary Barlow’s production company in the wake of Pop Idol exposure, she made an album for Decca, which was promptly shelved when the record company restructured. Meanwhile, Barlow, who continued to be a champion of her work, became preoccupied with the revival of Take That, and Birchall’s career was interrupted by family illness and personal loss. But if the last five years have been a bit of a roller-coaster, she’s very much back in the ascendant following Barlow’s advice to get into the driving seat. Something to Say is a polished production, and Birchall was particularly impressive when she launched the album at a showcase in July. On a humid evening in the oak-panelled cavern upstairs at Kettners, packed with seasoned music hacks and industry insiders, she commanded the room impressively with a brisk set that easily kept the wailing Soho police sirens at bay: no mean achievement. Birchall excels at the Nashville-tinged ballad. “All About Love”, “Wonderful” and the title track, “Something to Say”, are well-constructed, radio-friendly earworms with upbeat lyrics. But in true country-influenced tradition, there’s also an underlying melancholy and a more than a hint of bitter experience in some of the low-key numbers, particularly the standout track, “Unanswered”, with its aching, Dusty-style piano. The covers, which include “I Don’t Want to Talk About It” and Olivia Newton-John’s “I Honestly Love You”, are fine, straight-down-the-middle interpretations. But on the evidence of the rest of the album, Birchall doesn’t really need to bulk out her own song-writing talents with other people’s old crowd-pleasers. Arabesque is an edgy, moody collection of songs to thrill the musical iconoclast. Classical purists might run for the hills but Danish jazz singer Cæcilie Norby has come up with some extraordinary settings that shed new light on familiar melodies by Rimsky Korsakov, Satie and Debussy, boldly applying her own astringent lyrical interpretations of the stories behind them. The result is an impressionistic aural feast, punctuated by a burst of funky swing (“Bei mir bist du schoen”), a couple of Michel Legrand tracks and an inspirational take on Abbey Lincoln’s “Wholly Earth”. In short, Norby, who has been a pioneer of modern Nordic music, straddling the choppy territory between jazz and pop with her refusal to be categorised, has sharpened her maverick credentials and come up with an audacious concept. Just when you think you’ve pinned it down, the musical influence on each track shifts into new territory. “The Dead Princess” takes Ravel’s haunting theme and turns it into an exploration of the character of the composer’s benefactress, Princess Winnaretta de Polignac. His “Pavane”, so evocative in any setting, is transformed into a brooding meditation on the power of music to arouse memories and sensations. Norby isn’t the first musician tempted to take liberties with Rimsky Korsakov’s “Scheherazade” – prog rock band Renaissance built an entire album around it in the 1970s – but she treats it with great respect, her Arabian Nights-inspired lyrics swirling among the excellent accompaniment of musicians including pianist Katrine Gislinge, co-producer Lars Danielsson (on bass, cello and organ). The percussion of Anders Engen and Xavier Devandre-Navarre is a crucial ingredient of Arabesque, fluid and driven, providing a great counterpoint to the fascinating texture of Norby’s voice. There is more than a hint of Berlin cabaret in her timbre – at times, comparisons with Ute Lemper are valid – but her phrasing is always contemplative and modern. Norby is more about the inner monologue than playing to the gallery. Other highlights include “The Tears of Billie Blue”, a shimmering interpretation of Debussy’s “Claire de Lune”, and “No Air”, which turns Satie’s Gymnopédie into sultry, delicate soliloquy. There is also a Danish version of Legrand’s “Windmills of Your Mind” (“Hvirvelvinden”) and a bonus track, “How Oft”, a tribute to the singer’s father, Erik, who composed it. An absorbing landscape of an album.